← What lies over the Old Rattlechain brickworks? It is certainly known that Rattlechain lagoon contains chemicals (white phosphorus) that have systemically poisoned wildfowl. There have also been anecdotal claims of at least one dog entering the water and dying when Albright and Wilson were still depositing waste in the lagoon and the tanker drivers used to leave the gates wide open for anyone to enter between runs to and from the factory. Before licensing and in the days when the tip was a free for all unregulated depository , there are strong anecdotal recollections such as those of Malcolm Edge recalling how youths used to enter the unfenced lagoon and also the chemicals reacting within the water. 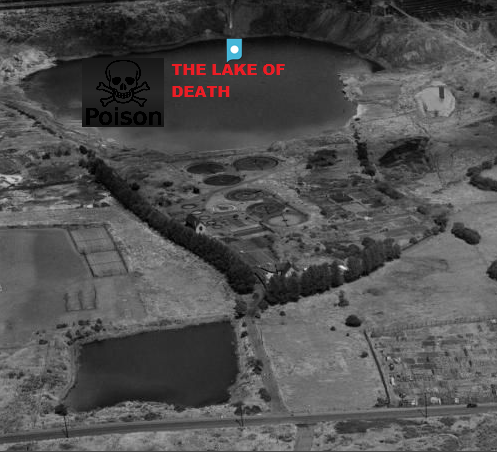 This is supported by press reports of the day as to how the lagoon water was “a peril to children” in an article from 1957. 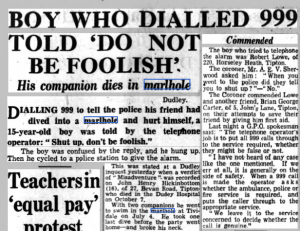 But before this, another article from 6th July 1953 Birmingham Daily Gazette confirms how one unfortunate young swimmer at this site lost their life. 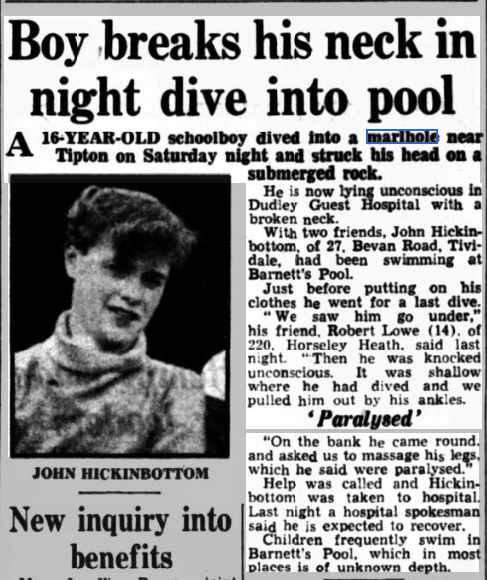 Local youth John Hickinbottom appears to have been swimming and diving in the lagoon, here named as “Barnett’s pool”. There can be no other “Barnett’s pool”, and it is interesting to see how history at this point still links it to the rattlechain brickworks and former owner, even though at this time Albright and Wilson were undisputedly depositing their phosphorus waste into the site. 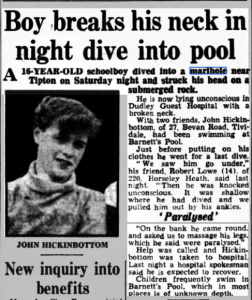 The article supports how children used to swim in the pool of “unknown depth”, though not mentioned are the toxic chemical risks of doing so. 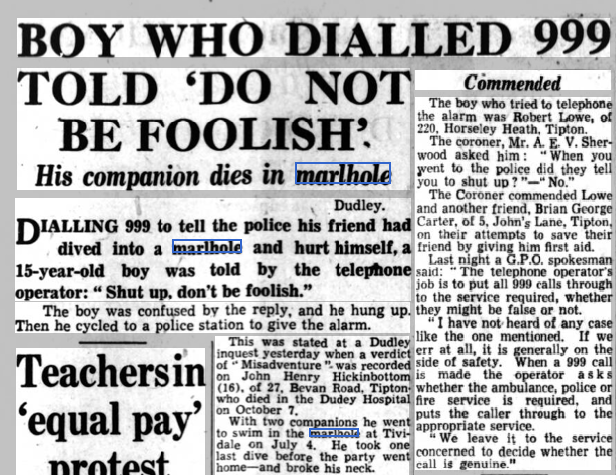 A follow up article from the same title of October 14th 1953 confirms the youth’s death as well as the callous nature of the call operator when one of his friends had tried to raise the alarm. Such an incident today would undoubtedly have made national headlines. I do find it very odd that the company who “acquired” this site for waste disposal are not named or even asked for comment about their appalling lack of security for what was a hazardous waste tip. But it is perhaps typical that they would have accepted “no responsibility” for the actions of others or their “misadventures”, and also typical that no one in authority had bothered to ask the directors of the company what they were depositing there. It would have been interesting to see a toxicology report on the unfortunate lad, though a “broken neck” no doubt provided them and the British Government to whom they supplied their phosphorus war machine with a convenient alibi.